There was a time when you needed to relocate to become a successful writer. Basically, you had to go where ever the work was. The Internet has opened a whole new world for writers. The idea of working from home has become a welcome component of freelancing. Today you can sit in your kitchen and write for a publication based overseas. You can write for a company in New York from the comfort of your home office in New Zealand. You can also write for clients from anywhere in the world while on holiday and wearing your swimsuit. There is still a need for local writers to write about local events, but freelancers can write about anything at any time no matter what the time zone. There is a growing acceptance of freelance writers for both print and digital content. I guess one of the primary reasons has to do with the cost-effective nature of freelance writing. As publishing companies have worked to streamline their operations they have come to rely more on freelancers who can provide copy on an ‘as needed’ basis. 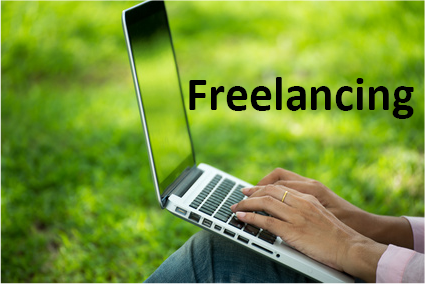 For the freelance writers this provides a sense of personal freedom and income. The benefit for the publisher is in not having to pay for a full time writer. You don’t have to pay overtime. You don’t have to pay sick leave. You don’t have to provide benefits. You can pay a freelance writer more compared to a full-time employee. Most freelancers are keen to please and are likely to provide their best work. You have the satisfaction of knowing there are many freelancers available. You decide if you’ll work with a client or not. You can work as much or little as you want to. A satisfied client often comes back and they may bring referrals with them. If you need time off, you only need to ask yourself. The possibilities for a freelance writer are growing each day. The need for good content from writers is huge and a freelance business may provide a better source of income than you could ever have imagined. There’s no doubt that it’s hard work, but it’s also doing something you love. If you enjoyed this article, you may also enjoy “Working from home needs the right attitude” . Please feel free to share socially or leave a comment below. 20 Comments on Freelancing – Just write! I like your site, Gaylene, and this is really useful information you provided in this post. There are a lot of people who love to write, and I am one of them.Really, with a number of new sites appearing each day, writing work will always be demanded. You have an amazing niche, almost everyone would love to stay home at their comfort zone and making money. You did a great job. I will share your website to some people that I know. Keep up your good work. I often thought about doing freelance writing, but as I don’t have a university degree, I figured I’d have a hard time attracting the kind of clients that will pay decent fees for my work. Any suggestions on how to find the “right” type of clients? I’ve looked at sites like Fiverr, but I’m not really willing to work for pennies. Some of the most intelligent people I know do not have any degrees or formal qualifications at all! And in my opinion, they have exceptional writing abilities. I think if you are passionate about something then I say write about it. In terms of finding the right clients, like anything, it takes time for you to build up your reputation as a competent writer, but you have to start somewhere. There are many options available, like Fiverr as you mentioned and one that I’m part of Freelancer. I haven’t looked at other programmes but I know there are plenty of them out there. If you have your own website or blog, then that’s a good starting point, in terms of building a strong following through the content you provide. And if you’re providing value to your followers, then your reputation as an expert in the field you’ve chosen will improve, and open the doors to other opportunities. Ya, I am planning to apply for a job as a SEO content writer. I love freelancing as I have more freedom in this world. Honestly, I feel that I work 10 times harder when I work from home. I have Asperger syndrome and do not like petty stuff like office politic and too much environmental stimulation. Honestly, ever since I start becoming my own boss. I work almost 18 hrs a day lol. Hello Gaylene, this is very useful information. I love reading and I’m good at writing. I’ve always dreamed of becoming a full time writer and earn an income on the internet. How can someone like me who has minimal website knowledge get started in freelancing? Thanks for the comment. There are a few options, here are two of them: You could sign up to a programme like Freelancer which is a global crowdsourcing market place where companies, organisations or individuals post up jobs they need doing like, web design, app developments or articles, and as a freelancer you bid for the work. This is a good option if you don’t want a website. But if you do want a website or a blog, then I recommend Wealthy Affiliate as a starting point, because you can get started for free which comes with two free websites plus access to the training for seven days. For more information about Wealthy Affiliate check out my page on Affiliate Marketing here Please be aware that I have included affiliate links in this comment please see my Disclaimer. Kia pai to rā. I would love to do something like this. I’m so tired of working for someone else. Thanks for this. You would be awesome! Kia pai to rā. I love your site, and what a great post. I am going to share this with my nephew so he can see other ways of making money, especially when they aren’t coming from his Auntie.. lol.. I really like your site it looks great! Working from home is something I really want to do in order for me to continue being an expat overseas. How do you find work doing freelance writing? I think I’m going to refer my oldest grandson to your website. He graduated a year ago with a BA in english but has not found it easy to get writing gigs. Freelancing sounds like it might be the way to go.